Eggs were once thought to be linked to an increased risk of heart disease due to the cholesterol-rich yolks. Groups like the American Heart Association quickly promoted this idea, advising people not to consume the yolk. However, the fact is that dietary cholesterol does not have much of an effect on blood cholesterol. Clinical studies support this fact. 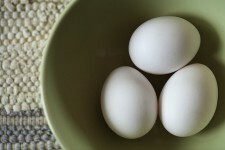 A study published in JAMA in 1999 that looked at two prospective cohort studies including almost 38,000 men and 80,000 women found that consuming five to six eggs weekly was not associated with increased risk of heart disease or stroke. And a meta-analysis published in BMJ last year including eight articles and a total of about 260,000 individuals found that higher consumption of eggs up to one egg per day is not associated with increased risk of coronary heart disease or stroke. Dr. Frank Hu, a professor of nutrition and epidemiology at the Harvard School of Public Health and author of both studies says that there might be small increases in blood cholesterol as a result of consuming large amounts of dietary cholesterol. He adds that beneficial nutrients such as protein, vitamin B12, riboflavin, folate and vitamin D that are contained in egg yolks may counter the effects of cholesterol. Well, the American Heart Association has changed its tune, recommending that people limit their cholesterol intake to about 300 milligrams of cholesterol a day. Eggs, which are no longer off-limits according to the guidelines, contain about 200 milligrams, yolk and all. ACSH s Ariel Savransky adds, There is no reason why eggs cannot be a part of a healthy diet. The old saying everything in moderation certainly applies here for healthy people.